When the classic children’s book The Phantom Tollbooth celebrated its 50th anniversary in 2011, laudatory articles were written about it, parents named their children Milo in record numbers, and seriously devoted fans tattooed the iconic Tock the watchdog on their bodies. But lost amidst most of the celebration was the unlikely story of the book’s creation. Lucky for us, Greenpoint-based documentary filmmaker Hannah Jayanti decided to dig a little deeper, spending two years interviewing author Norton Juster, illustrator Jules Feiffer and their multi-generational legion of fans. 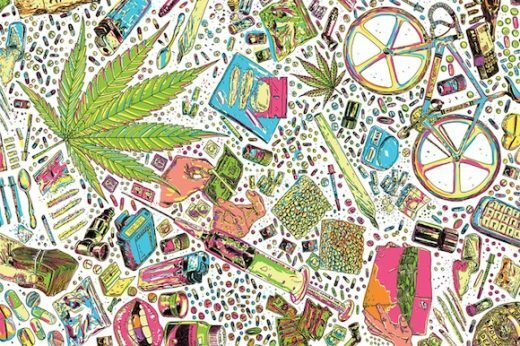 Peter Madsen’s Dealers collects interviews with 15 New York City drug dealers including a weed-peddling bike courier who doesn’t even smoke the stuff and a coke dealer with a penchant for losing his vials and coming up short — plus a favor-granting doorman of a luxury building in Flatiron. Madsen, who lives in Williamsburg, has also compiled hundreds of man-on-the-street interviews he conducted starting in 2010 that you can check out on his blog, Word on the Street New York. Here’s the B+B Q+A. Used to be that bike messengers were just about the only ones willing to brave the mean streets on two wheels, but we now live in an age where even dogs are riding bikes. 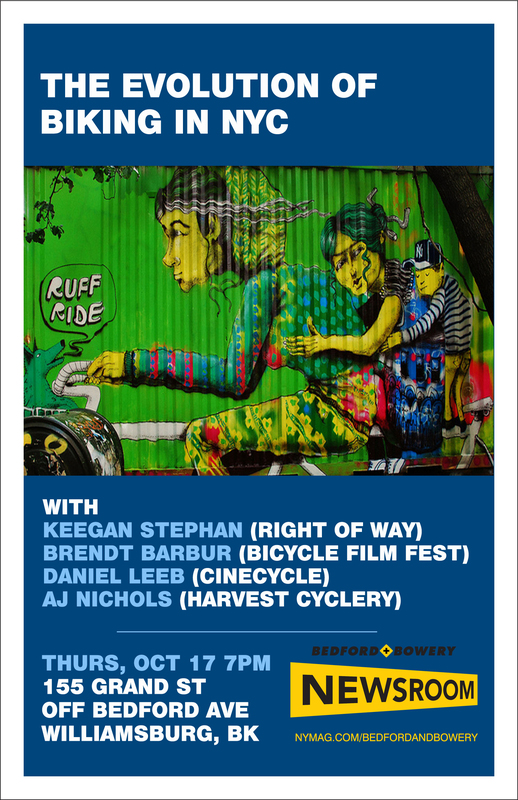 Join us tonight and grab a free Stumptown stubbie (plus one for the road) as some spokespeople who’ve seen it all discuss the evolution of biking culture in NYC. Keegan Stephan will have some news to share: this week the writer, activist, and co-host of “Bike Talk” (WBAI) announced the creation of Bike Yard, a pop-up for cooperative bike repair that’ll be located in Havemayer Park through next year. Stephan founded Cranked Up!, a cycle club and advocacy group, while at Sarah Lawrence and, after graduating, opened a bike shop in the South Bronx. He started volunteering — as a mechanic and eventually as an instructor, administrator, and organizer — at the legendary environmentalist non-profit Time’s Up in 2010 and went on to revitalize Right of Way, the direct-action street justice group best known for its unauthorized bike lanes. Brendt Barbur started the Bicycle Film Festival in 2001 after he was hit by a bus while riding in New York City. The festival — along with Joyride, its affiliated art show — has since gone beyond the streets of the East Village to become a worldwide phenomenon, and has traveled to over 50 cities (it made a stop in London earlier this month and visits North Carolina next week). This year’s New York installment featured 60 screenings of bike-related films and a blowout performance by Blonde Redhead. AJ Nichols was repairing and selling bicycles out of a basement studio — and teaching at 3rd Ward — before he took a storefront on Bushwick Avenue this past summer and opened Harvest Cyclery, a vintage and used bike shop with a focus on reclaiming underappreciated rides. Daniel Leeb is a documentary filmmaker also known for his video installation work with artists such as Doug Aitken and avant garde musician Hisham Bharoocha. In 2003, he founded Cinecycle, a Williamsburg-based production company and boutique marketing studio that, among other things, has documented the rise of bike messenger culture in cities around the world — most notably in a short film, “Messenger,” that was commissioned by Puma in 2004. They’ll all be coasting into the Newsroom at 7 p.m., so join us then at 155 Grand Street, off of Bedford Ave., in Williamsburg. Can’t make it to our tonight? Worry not: we’re coming at you live. Watch and listen as Brando Skyhorse, author of The Madonnas of Echo Park, reads from his forthcoming memoir, Five Fathers; Paul Rome reads from his debut novel, We All Sleep in the Same Room, out this month; and Patricia E. Gillespie reads her poems from the recently published anthology, Bushwick Poems. And then keep on watching as they chat about living and writing in the neighborhood. 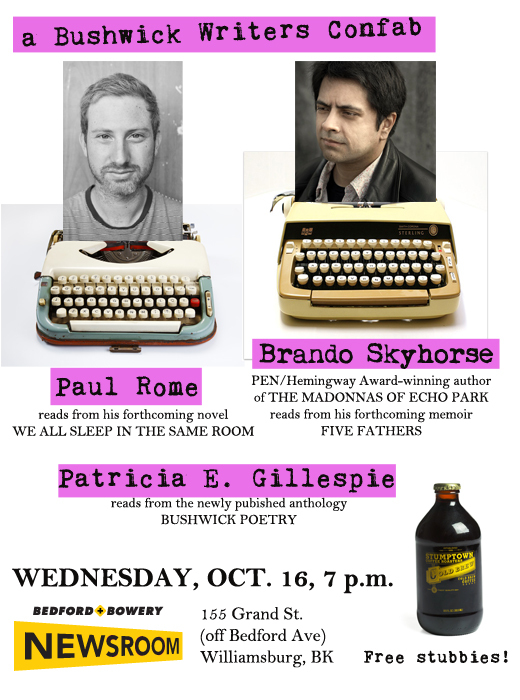 The stream starts around 7 p.m.
Brando Skyhorse: The LA-born author of the highly praised debut novel The Madonnas of Echo Park (winner of the PEN/Hemingway award and Sue Kaufman Prize) is a fixture at KGB‘s Sunday Night Fiction series in the East Village, but he actually makes his home in Bushwick. Tonight he’ll read from his forthcoming book, Five Fathers. The memoir of growing up with five stepfathers and being a Mexican-American who was raised as a Native American will be published in June of 2014 by Simon & Schuster. Paul Rome: You’ve seen this guy around. He manages the Wyckoff Starr and his performance literature has packed the house at the Bushwick Starr — so he has a lot of starr power? Anyway, his debut novel, We All Sleep in the Same Room, comes out this month (see the just released book trailer). The psychological bender, about the unraveling of a Union Square labor lawyer, has already been called “a powerful symphony of melancholy and wisdom” by National Book Award finalist Howard Norman. Patricia E. Gillespie is a professional filmmaker whose writing appears in Bushwick Poetry, a just published anthology of Bushwick poets. She teaches at the New York Film Academy. 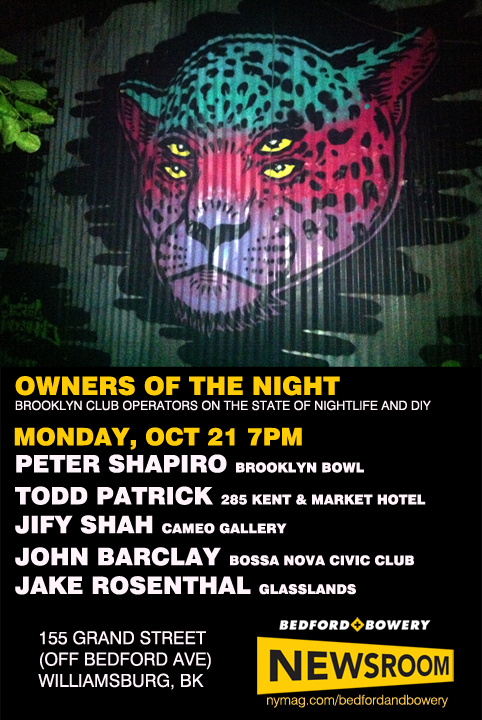 After spieling with a pair of downtown memoirists about changes in the East Village and Lower East Side over the years, we brought together to talk North Brooklyn. 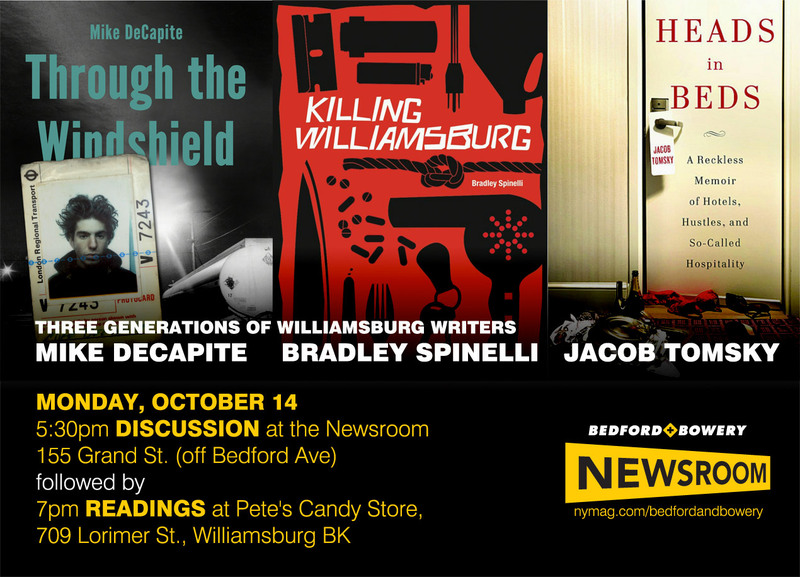 Yesterday, before their reading at Pete’s Candy Store, we spoke to Mike DeCapite and Bradley Spinelli, who both live in Williamsburg, as well as Jacob Tomsky, a Bushwick novelist whose hotel memoir, Heads in Beds, hit the New York Times bestseller list (again! this time as a paperback) earlier this month. Friday at the B+B Newsroom Rayya Elias, author of Harley Loco: A Memoir of Hard Living, Hair, and Post-Punk from the Middle East to the Lower East Side, and Brendan Jay Sullivan, author of Rivington Was Ours: Lady Gaga, The Lower East Side and the Prime of our Lives read from their recently published memoirs and talked about the changes they’d seen in the East Village and Lower East Side over the years. Play the video to watch the readings and conversation. And here’s what happened when an audience member asked the authors to compare the eras during which they moved to the city (the late ’80s and mid-aughts, respectively). 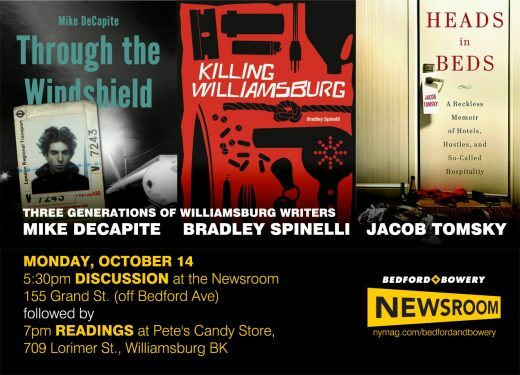 On Monday, join us at the B+B Newsroom as we talk to authors whose work spans three decades in Williamsburg. After the 5:30 p.m. discussion we’ll head over to Pete’s Candy Store, where, at 7 p.m., they’ll read from their books. It’s all free; just let us know you’re coming. Jacob Tomsky, is in his early 30s and just hit his ten-year Williamsburg anniversary. His memoir about the hotel industry, Heads in Beds, is a New York Times bestseller. The New York Times Book Review said “the prose is brisk and smart,” and Janet Maslin (also in The Times) calls Tomsky “an effervescent writer.” Elizabeth Gilbert, author of Eat, Pray, Love, calls him “a star.” Jake is also the founder of Short Story Thursdays, a weekly, email-based short story club, which has been sanctioned by the Paris Review. Heads in Beds was released in paperback in August. Bradley Spinelli, a former stagehand in his early 40s, has lived in Williamsburg since 1999. His debut novel, Killing Williamsburg, imagines a suicide epidemic in New York City, as told by a proto-hipster lighting technician in 1999 Williamsburg. Publishers Weekly says “Spinelli offers sharp and stylish prose.” The book’s launch party featured a three-hour “Suicide Set” by DJ Questlove. Mike DeCapite, a former taxi driver and the elder of the group in his early ’50s, lived in Williamsburg in the late ‘80s (and then moved back there in the mid-aughts), when his work first appeared in three issues of Richard Hell’s CUZ magazine. In 1999, his cult-classic novel about his taxi-driving days, Through the Windshield, drew a rave from the San Francisco Chronicle. Harvey Pekar, writing in the Austin Chronicle, called it “one of the better American novels of the past several years,” and Jocko Weyland, in Rain Taxi, called it “a down-at-the-heels masterpiece.” DeCapite has recently published the chapbook Creamsicle Blue and the prose collection Radiant Fog.